Raising children can be fulfilling and frustrating. Seeking out parenting advice can make a difference between the success and failures in parenting. Being a parent is a job full of challenges, large and small. Wouldn’t it be great to have a source of expert parenting advice? And especially in the biggest challenges, wouldn’t it be reassuring to have access to the best parenting advice of all? You are so excited! Your new baby boy came home happy and healthy. You watch as he grows before your eyes. He is so full of energy, has a huge smile with those cute little dimples, and his laugh is contagious. It seems in no time at all he learns how to walk and talk. It is tough for you (Mom and Dad) to keep up at times. He has more energy than it seems is humanly possible! As your son continues to grow, you enroll him in T-ball and other sports and recreational activities. It isn’t long before he’s taking music lessons and getting started in school. As time continues to pass, he’s moving from elementary school to middle school. Much of your time is now dedicated to picking him up from after-school programs, helping him with school projects and making sure he and his two younger sisters have all they need. You are so proud of all three of them! By now they are all involved in numerous activities and have friends in school and in church. Then one day you get an unexpected call from the school principal. She informs you that your son was caught cheating on a test. With great disappointment, you try to have a long discussion with your son when he comes home. He becomes distant and a bit sullen. He doesn’t want to talk about it, and he seems only to want to be anywhere but with you. A couple of months later you are shocked when your son is caught smoking pot at school. Why would he do this? You have diligently taught him to stay away from drugs. You also taught him to honor his mother and father, yet at times he is becoming very disrespectful to you and your spouse. Why would he think he can behave this way? Doesn’t he remember who took care of him and provided everything for him when he was growing up? You try hard to help him and “be his friend,” with seemingly mixed results. Over time, some things get better while others don’t. Your honest evaluation is that your wonderful son is growing more and more selfish. Everything he does is focused on what he can get from others or how he can promote himself. And if it isn’t fun, he won’t do it. Where did the attitude come from? What has happened? Where did this come from? Is this what every parent has to look forward to? You have tried so hard to give him every opportunity you could, and you just can’t understand what happened. Is this the way it is for everyone? Does it have to be this way? How do we break him from being so selfish? He never used to be that way—or did he? The truth is that all parents face various challenges in raising their children. There are no perfect parents or perfect children. But there is a common mistake made by many parents who love their children very much. It is a mistake made with all the very best of intentions—and it may make the difference between having children who grow up to be emotionally healthy and balanced or not. The difference lies in the foundation of our parenting. We all make decisions within our families based on our underlying belief system. Our belief system determines how we raise our children—it is what seems right to us. The best parenting advice is to make our home a God-centered home rather than a child-centered home. What’s the difference between a child-centered home and a God-centered home? Many parents assume that a child-centered home is a God-centered home. After all, what could be wrong with putting your children’s wants and needs first? How could that hurt them? To answer this question, let’s first define child-centered and God-centered. A child-centered home is one in which the primary motivation for everything that is thought, taught and done in the home is focused on the children and what they want or need. And after all, the Bible teaches that we should love others as we love ourselves. So, if we’re trying to shower our children with love and attention, isn’t that not only good, but godly? Yes, it is true that God teaches us to love one another as we love ourselves, but He also teaches us that there is something that comes ahead of that command. “Jesus said to him, ‘You shall love the LORD your God with all your heart, with all your soul, and with all your mind.’ This is the first and great commandment” (Matthew 22:37-38). If we think about it carefully, we should begin to see a problem with the child-centered home. God commands that we seek Him first in everything we do—including our families. Rather than child-centered, where life revolves around our children, our families should be God-centered. That means everything that is thought, taught and done in our homes should be founded on our love for God and following His instructions. Let’s consider an example. Let’s say your child comes to you and wants to participate in youth soccer. You are fine with this and are willing to take him to and from practice and the games. You want to be a good parent and provide him with healthy, fulfilling activities. He wins a spot on the team, and practices begin that next Monday. All is good until the schedule comes out and you find that some of the games are on God’s day of rest. Your family has taught the importance of worshipping and obeying God and going to church—but your son really wants to play soccer! So you now have to make a choice—do you allow him to play the games on God’s Sabbath (Exodus 20:8-11), or do you hold to the practice and belief of your family and put God first? Your choice is between following the will of God or giving in to the will of your child. Whether you have a child-centered family or a God-centered family will determine the decision you will make. What would you choose to do? What values and strength of character will you demonstrate to your children? If we really love our children, we need to be motivated more by what God teaches than by any other influence—including whether we are making our children “happy.” When we put God first, our children see and learn what is right and what is wrong. They learn what will ultimately make them happy and bring fulfillment, as opposed to what they believe will make them happy and lead to fulfillment. If we do not practice this, it is merely a matter of time before our approach will lead to frustration, hurts and bad consequences. God-centered should always trump child-centered—this is wise parenting advice. How can we evaluate our own homes? 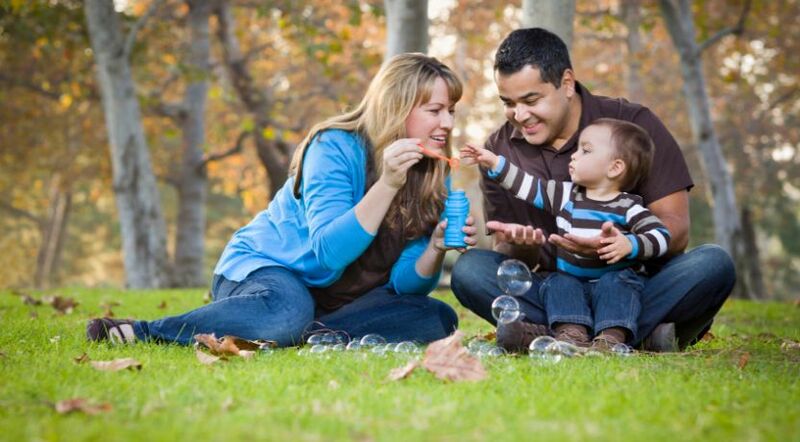 How can we determine whether our families are God-centered or child-centered? When this is our motivation, the decisions we make regarding child rearing will be different than if our motivation is child-centered. As Proverbs 14:12 advises us, “There is a way that seems right to a man, but its end is the way of death.” In other words, what can seem like a good thing to do for our children may not be that at all. The only sure foundation for our families is following God’s parenting advice in the Bible. Then and only then can we become a God-centered family. The Bible is the best book of answers ever written. It is the only book in which each author was inspired by God to put His thoughts down in written form. It is the Word of God. If you can believe that, then you can also know it is the most important parenting advice manual ever written. However, the real value of knowledge is when it is applied. Sometimes parents have to practice “tough love.” In reality, “tough love” can be tougher on us as parents than on our children! “No” because it would hurt them. “No” because we don’t have the money. “No” because it wouldn’t be wise based on what you read in the Bible. Everything God says matters. Even what many may consider to be small points should not be disregarded. If we value the Bible, we will use it as the foundation of our parenting. But conventional wisdom often tells us we should make our children and their needs and desires the center of our homes. It teaches that we must show our children that they are the most important things in our lives. As good as that may sound, the results of doing so aren’t good. They aren’t good, because centering on our children violates a principle taught by the greatest Father of all time. Which way will you choose? We encourage you to make your home a God-centered home. It is guaranteed to produce wonderful results because it is based on the infallible Word of God. In the long run you won’t be disappointed!